Friday December 19th 1890 It was a fine day. Anna washed some things and I was busy at home all day. I fixed some of my dressed and in the evening Will and I worked at fixing the fly net smaller. Pierce went home at noon. Saturday December 20th 1890 I was busy about the work all forenoon. I took the plants out and cleaned the bay window. Will and I went to town in the afternoon. I did a few errands and went down to visit Mother. Anna went home for a weeks visit. Will and I worked all the evening fringing the fly net. Sunday December 21st 1890 I was all the forenoon getting the work done up and dinner ready. Will went up in the country, Mother came just at dinner time. Her and I had a visit in the afternoon. Will was over town Ott & Fanny came over late in the afternoon and they all stayed till l after supper. We had a very pleasant little visit. 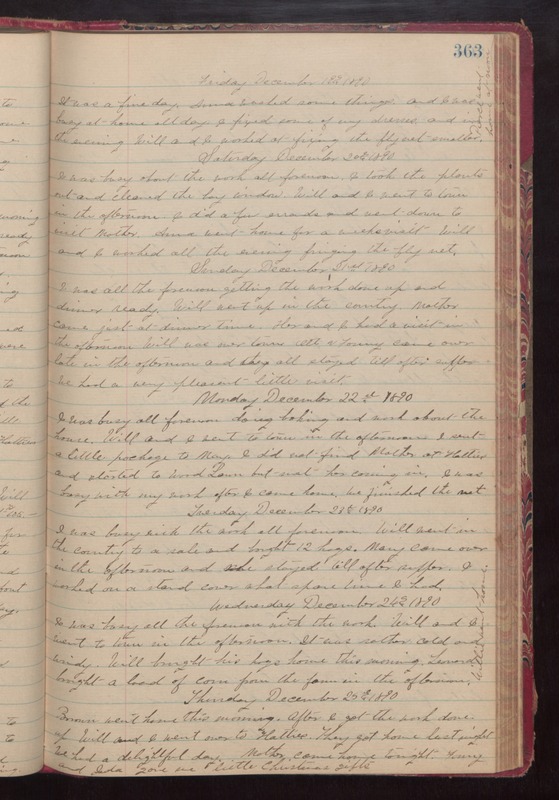 Monday December 22nd 1890 I was busy all forenoon doing baking and work about the house. Will and I went to town in the afternoon. I sent a little package to May. I did not find Mother at Hatties and started to Wood Lawn but met her coming in. I was busy with my work after I came home. We finished the net. Tuesday December 23d 1890 I was busy all the forenoon with the work. Will and I went to town in the afternoon. It was rather cold and windy. Will brought his hogs home this morning. Leonard brought a load of corn from the farm in the afternoon. Willie went home. Thursday December 25th 1890 Brown went home this morning. After I got the work done up Will and I went over to Hatties. They got home last night. We had a delightful day. Mother came home tonight. Fanny and Ida gave me little Christmas gifts.